You Pay an Agent 6% … For What? Do You Actually Know? The Kitchen in this luxury home is GORGEOUS! — all of it hand-carved and created onsite by master craftsman. And the owner says to me …”be careful not to step on my Kitchen Mouse”. Kitchen Mouse? Okay …. if you’re me …. that is generally NOT something you w ant to hear. And she continued, “there he is .. right at the base of the cabinet” pointing in the direction of the floor at the side of the built-in SubZero fridge and freezer. And so he was .. and such was my introduction to Jerry, The Hand-Carved Kitchen Mouse .. who is so TOTALLY charming. It turns out Jerry was a whimsical gift to the home owner by the master craftsman when they completed her custom kitchen. 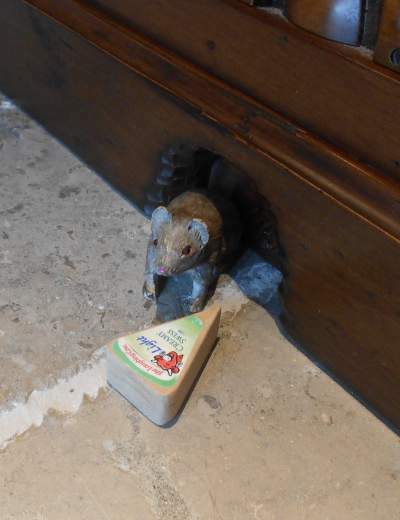 So there he is with his hand-carved wedge of cheese just outside his mouse hole home at the base of the refrigerator. Soooo cute….! I WANT ONE!!! Does your kitchen have a hand-carved Kitchen Mouse? SMARTePLANS® is the premier marketing system for luxury homes featuring online easy-to-read pictographic floor plan pictorials, where the photographs launch from inside the floor plan … NOW all the photos make sense! SMARTePLANS® is very effective at selling high end luxury properties. You can seamlessly click around the property, viewing the photos in relationship to the pictographic floor plan drawing. This is not a video … you choose what you want to view … or not. [TIP: Hold down your CTRL key and roll your mouse wheel to quickly zoom in and out of the drawing — no detail is too small to see!] The compilation above is the original creative work and copyrighted property of SMARTePLANS®. You may link to it; but it may not be copied, nor reproduced in any form or format in whole or in part without the express written permission of Judith Sinnard. Site developed by Web Design Houston.